As the Pentagon prepares to release its highly anticipated survey of military personnel about the “Don’t Ask, Don’t Tell” policy, most Americans (58%) say they favor allowing homosexuals to serve openly in the armed forces. 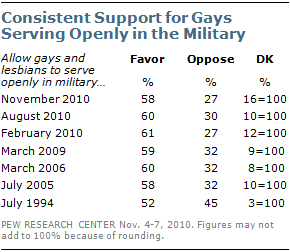 Fewer than half that number (27%) oppose allowing gays and lesbians to serve openly. that year, 52% said they favored allowing gays and lesbians to serve openly in the military while 45% said they opposed allowing this. The national survey by the Pew Research Center for the People & the Press and the Pew Forum on Religion & Public Life, conducted Nov. 4-7 among 1,255 adults, finds continuing partisan and religious differences in opinions about whether to permit gays and lesbians to serve openly in the nation’s armed forces. Large majorities of Democrats (70%) and independents (62%) favor allowing gays to serve openly. Republicans are divided (40% favor, 44% oppose). 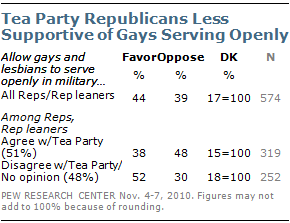 Among conservative Republicans, far more oppose than favor allowing gays to serve openly (52% to 28%). Nearly half (48%) of white evangelical Protestants oppose letting gays serve openly in the military, while just 34% support this proposal. Majorities or pluralities across other religious groups favor allowing gays to serve openly. The balance of opinion across age groups is in favor of letting gays serve openly. Those 65 and older are the only age group in which fewer than half (44%) favors this; still just 28% of seniors are opposed to gays and lesbians serving openly while an identical percentage offers no opinion. Two-thirds of college graduates (67%) favor gays and lesbians serving openly, as do more than half of those with some college experience (55%) and those with no more than a high school education (54%). Among all Republicans and Republican leaners, those who agree with the Tea Party are less supportive of allowing gays to serve openly than are those who disagree with the Tea Party or have no opinion of the movement. Only about four-in-ten (38%) Republicans and Republican leaners who agree with the Tea Party favor allowing gays to serve openly while 48% are opposed. Among those who disagree with the Tea Party or have no opinion of the movement, 52% favor letting gays serve openly and just 30% are opposed. the Pew Forum on Religion & Public Life. Both organizations are sponsored by the Pew Charitable Trusts and are projects of the Pew Research Center, a nonpartisan “fact tank” that provides information on the issues, attitudes and trends shaping America and the world.